We’d love your help. 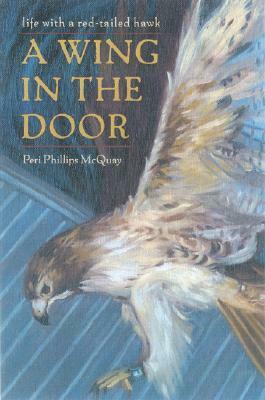 Let us know what’s wrong with this preview of A Wing in the Door by Peri Phillips McQuay. To ask other readers questions about A Wing in the Door, please sign up. The author renders the intimate relationship between herself and Merak, the young hawk she is rehabilitating to live in the wild, clearly and beautifully. Reading this book was a rare chance to get to know a wild hawk's spirit. The book was an interesting story of following by airplane an electronically tagged Red Tailed Hawk's migration. A delightful story about the accidental acquisition of a red-tailed hawk as a sort of pet, and how it matures and fails to mature, interacts with humans, real pets, and other birds. For thirty years Peri and her conservation educator husband Barry took joy in living and working at Foley Mountain. This eight-hundred-acre conservation area of granite ridges, beaver ponds and towering pines overlooks the beautiful little village of West Peri McQuay became committed to nature through the inspiration and teaching of her Canadian artist parents, Ken Phillips and Marie Cecilia Guard.